A ridiculous “controversy” over the portrayal of Apu on “The Simpsons” speaks volumes about a younger generation's overblown sensitivity to just about everything. First, a disclaimer: I am not Indian-American. As a result, I cannot fully know an Indian-American's experience of seeing Apu go about his life on this cartoon show. Having said that, it seems to me the energy some have expended lately to air their objections about the portrayal of Apu represents a great deal of energy wasted. In a recent TV Blog, I complained about today's culture of vigilantism and outrage. The context was the withdrawal of advertisers from Laura Ingraham's Fox News Channel show in response to a tweet she posted that denigrated one of the survivors of the Marjory Stoneman Douglas High School tragedy in Florida. Today's topic is much less serious. It has to do with a caricature on a cartoon show that has been a part of our mass-cultural lives for 30 years. For most of that time, no one batted an eyelash over the way Apu, proprietor of this cartoon town’s fictional Kwik-E-Mart, was depicted. He was just one of many comedic characters seen on “The Simpsons,” which has long been one of the finest shows in the history of television -- brilliantly rendered, written and voice-acted. 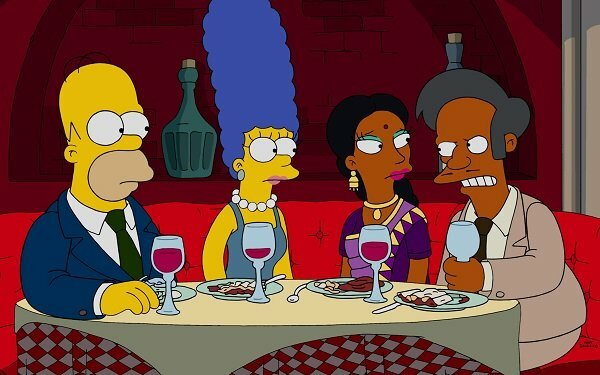 Among the show’s greatest episodes were some in which Apu was prominently featured, including a 1995 episode in which Paul and Linda McCartney guest-starred, and the one in 1997 in which Apu was married in a Hindu ceremony in the Simpsons’ backyard. There are likely many more, but “The Simpsons” has produced well over 600 episodes, which presents a challenge to anyone who would make sweeping generalizations about the portrayal of any one character. Nevertheless, a number of so-called critics have come out of the woodwork lately to condemn the entirety of the “Simpsons” canon for what they feel is a racist portrayal of Apu. They seem to focus primarily on his voice, which is provided by Hank Azaria. But they also come to far-reaching conclusions about what they see as the great harm done by Apu to the greater society. The impetus for this revived discussion about Apu was a short scene in a new “Simpsons” episode a week ago that many interpreted as the show's “answer” to the Apu criticism. In that context, Apu is a very funny character, as are the whole Simpson family and dozens of other characters, from Chief Wiggum to Krusty the Clown. Krusty is Jewish, which figures into a great deal of the comedy surrounding him. Occasionally, his orthodox father shows up, voiced by the great Jackie Mason in as stereotypical a fashion as Mason can muster. If any Jews have complained about this, then I have not heard about it. Maybe it’s because comedy is a business Jews know and understand very well. In fact, I have long generalized about Indian people that they are a joyous, humor-loving people as well. I am sorry if this compliment offends anyone. The pain elicited by the scene in “The Simpsons” was so sharp to some that it elicited numerous examples of breathless hyperbole. My advice to her: Don't take that bet because you will surely lose. Note the hyperbolic application of words such as “tragically,” as if Apu could wreak a tragedy on anyone, and the phrase “every brown kid.” Every one? This is the way writers and commentators of a certain younger generation express themselves these days. It is rarely measured or accurate. And one gets the feeling that at least some of the outrage they express in the media is feigned. Generally speaking, they often come across as if they don't know what they are talking about, although they have a vague sense that what they are ranting about will play well with their peers. Meanwhile, the rest of us are making sweeping generalizations of our own about the younger generation: They sure seem like a humorless bunch sometimes, don't they? The view from here is: Leave Apu alone. He is a joyous, lovable figure and a pillar of his Springfield community. Why not save all the vitriol for things that really matter? 2 comments about "Message To The Apu Vigilantes: He's A Cartoon, Get Over It". Douglas Ferguson from College of Charleston, April 16, 2018 at 12:36 p.m. So were Stepin Fetchit and Mantan Moreland just movie characters? At least the JADL protested Woody Allen's "Waltzing With Schopenhauer" in 1999. Truth told, I'm a big fan of the way humor used to be -- when Don Rickles insulted everyone --but those days are long gone. Ed Papazian from Media Dynamics Inc, April 17, 2018 at 8:02 a.m.
Douglas, even in times long past, when TV show or movie portrayals were deemed offensive to segments of the public, TV stations refused to air them. For example, the TV version of the radio sitcom hit, "Amos and Andy", which starred black actors in the title roles ( in radio they were white) was shunned by stations when reruns were made available via syndication. The same thing happened to the old Charlie Chan movies---many stations were reluctant to take them. So the Apu thing is nothing new. Frankly, I can see why it is offensive to a segment of the population which relates directly to the character as well as to many more who can see that its depiction creates a very negative stereotype. The reality is that as a country, we are fragmentaing into many self aware groups that are demanding recognition and fair treatment by the media, employers, politicians, etc. So those who create TV and movie "entertainment" content must learn to understand that this is a reality and they need to be more sensitive to it.